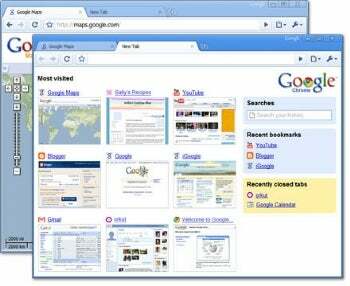 Google has upgraded its Chrome 2.0 Web browser from being in test mode (beta) to its final version ready for download and general use. With this latest update, compared to early beta 2.0 releases of the browser, Google adds new features includeing full-screen mode, an improved new tab page, and the support for auto-fill of text within Web page forms. Google says if you already are running Google Chrome your browser will be automatically updated to the final 2.0 release "soon." Otherwise, to download the latest version you can get it directly from the Google Chrome download page. Please check back soon for a hands-on review of final Google Chrome 2.0 Web browser. Improved New Tab Page: Give you the ability to remove thumbnails from the New Tab page. This allows you to, as Google puts it: "hide that embarrassing gossip blog from the Most Visited section." Full Screen Mode: In this mode you can hide the title bar and the rest of the browser window by hitting F11 or selecting the option in the Tools menu. Form Autofill: This feature, a staple in Internet Explorer and Firefox, auto-fills text boxes in Web page forms with information you've previously entered. Google released a short video outlining the latest improvements to the final release of Chrome 2.0.